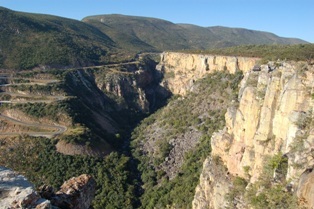 The bird collection housed in Lubango, southern Angola, contains more than 41000 skins of more than 850 species. 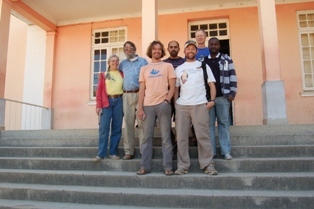 As part of an atlas project for Angolan birds, a team visited the skin collection for two weeks in June 2008, to obtain distributional data from the collection. The skin collection is still in good condition, and Instituto da Ciencias da Educacao (ISCED), who house the collection, are to be commended for this. Data from labels of 15000 skins were entered into an electronic database, including all specimens of lesser-known species. The remaining 25000 entries are being made from photographs of reference cards. Dieter oschadleus worked exclusively on the Ploceidae. Most Angolan weaver species are represented in the collection, notable exceptions being Ploceus aurantius and P. pelzelni. Pinto (1972) listed a specimen of P. pelzelni collected in Cabinda that should have been in the museum but it was not found. Several rare or uncommon weavers are represented: P. nigrimentus (2), P. insignis (5), P. subpersonatus (2), Pachyphantes superciliosus (10), Euplectes gierowii (1) and E. aureus (47). Three specimens of Ploceus velatus were collected by Rosa Pinto from the isolated Lake Dilolo locality. Pinto, A.A. da R. 1972. Contribuicao para o estudo da avifauna do Distrito de Cabinda (Angola). Mem. Trab. Instit. Invest. Cient. Angola 10:1-103. Ursula Franke and Dieter oschadleus did some ringing. 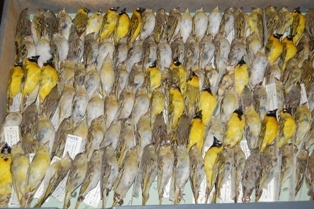 Weavers ringed were Golden Weaver and White-browed Sparrow-Weavers. 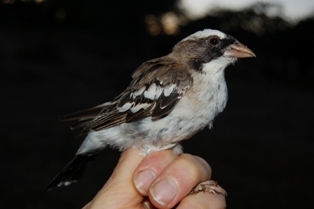 We had hoped for Chestnut-mantled Sparrow-Weavers! The team after an exhausting 2 weeks!